Unlike Year’s Cycle, Upside Down was not born out of unifying conceptual idea. The album is more a collection of individual pieces. 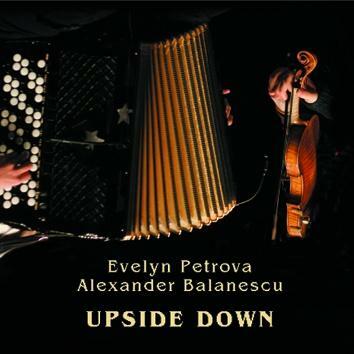 Each in a way is a reflection of how the two musicians were probing their way towards coherence and tightness of their musical communion: whimsy ease of Alexander’s violin flies over solid and earthy foundation of Evelyn’s accordion. I only wish there was more of her inimitable vocals, although in one piece they scream together. Their first live performance is scheduled in Bucharest for late April 2007 — in between the time when I write these notes and the album comes out. A duo has been born. The album title intimates a musical approach that defies the norm. In effect, they effortlessly merge Russian-folk with jazz improvisation and the classical element, while venturing into a rather opaque, avant-garde realm. The duo also treks into the free jazz vicinity, yet occasionally tempers the variable flows with lighthearted jazz and chamber-esque motifs. Simply stated, hearing is believing.